After days and hours of deliberations and help from friends. 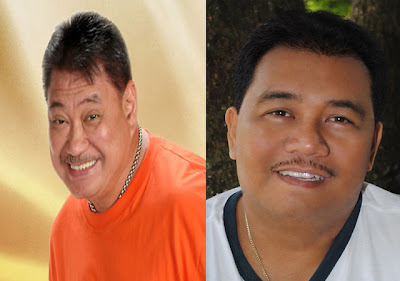 I have chosen the winner for last week's DiscOVIries promo - Artistahin: Celebrity Look Alike. But before I announce my Tope Entries and Winner, here are the entries submitted last week. And among the entries above, here are the three entries on top of my list. Danissa as Andrea Del Rosario. Uhm. Ito po ang resulta ng aking survey (na 3 lang ang sumagot). Meh. Pero sana "nabiyayaan" din ako gaya ni Andrea del Rosario. Kaso hindi, kaya naman I cropped THAT part sa photo niya. Napansin niyo ba? hihi. Bitter ocampo! Sabi ni Bro, magkamukha sila kaya kami dapat manalo this week. 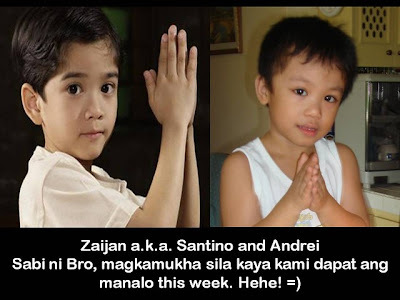 This is my son Andrei and his tv idol Zaijan (who plays Santino in the popular soap 'May Bukas Pa'. Congratulations to Jonald for bagging the prize. Please email me at joribenzaballa@gmail.com and send me your complete name and contact details where we can send your prize. And for the others, thanks for joining my promo. You still have 2 more weeks to join. Join this week's promo by going to this link. wow, may kasama din palang bag sa prize.ahehehe! maraming salamat joriben! di makapaniwala si erpat ko na kamukha siya ni jimmy santos, bakit daw di si aga mulach! ahehe! tnx uli!